When dedication, professionalism, and sheer hard work are recognised, it is great for morale, and for increasing both productivity and quality. And there has to be no more deserving industry than that of nursery workers. This is why Run a Day Nursery is pleased to present information about the National Day Nurseries Association annual Nursery Awards. What is the National Day Nurseries Association? The National Day Nurseries Association (NDNA) operates on a charitable basis and campaigns to improve the education and development of children of pre-school age. They provide support to NDNA members as well as supplying help and information to parents, liasing with local authorities and being involved in wider nursery communities. What Are the National Day Nurseries Association Awards? 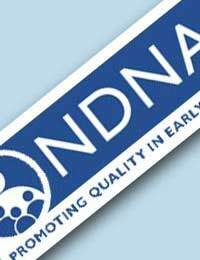 The NDNA awards are an annual event and were established by the charity to celebrate the best in the day nursery world. Can Our Nursery Advertise the Awards? Yes, of course. If your nursery wishes to canvas votes, opinion, or support for the awards, the NDNA will be happy for you to do so and will also supply a poster for you to put up in your nursery. You can also of course ask the parents of the children at the nursery to vote. If you wish your nursery to enter, all you need to do is complete a registration form and make sure you submit it to the National Day Nursery Association by the appropriate deadline. You may either do this by post, by fax, or online via their website. Alternatively, if you are a parent who wishes to nominate your child’s nursery as having done outstanding work, then you can do so in the same way by going online or by contacting the National Day Nurseries Association directly. There are a number of stages to the judging, with entries being judged in a number of ways. There is also a percentage system so that smaller nurseries don’t lose out to those which might be larger or better resourced. There are regional ‘heats’ with an eventual ten regional and national finalists. If your nursery has reached the last round, an assessor will then make an appointment to visit the nursery and make a report, whereby a judging panel will select regional and national winners from which an eventual UK winner will be selected. Overall UK Winnder 2008, was Kinder Haven Ltd, a Bradford-based nursery which judges thought outstanding in its development of high quality partnerships with their parents and extended community. So if you think your nursery, or your child’s nursery deserves a nomination, what are you waiting for? !